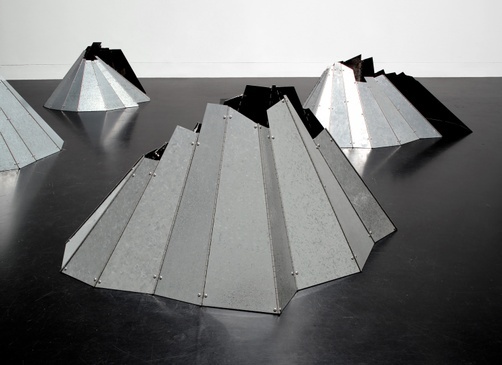 In spring 2014 artist Katy Schimert was interviewed by Skidmore College students Heather Ashe ’14 and Adam Smith-Perez ’14 about her work, Armored Landscapes, 1994, in the exhibition One Work, 2014. Katy Schimert is a New York-based who creates work in a wide range of media, including drawing, sculpture, and video that resemble dream-like, otherworldly, and cosmic landscapes. Interested in the interplay between the concrete and the conceptual, Schimert merges natural forms found in the landscape with elemental, abstract shapes that imbue her work with a mythic or archetypal resonance. Schimert, Katy. “Katy Schimert on Armored Landscape.” Interview by Heather Ashe and Adam Smith-Perez. 2014. Tang Teaching Museum collections website, last modified October 17, 2018. (https://tang.skidmore.edu/collection/explore/46-katy-schimert).